More than a tool, it's an heirloom. 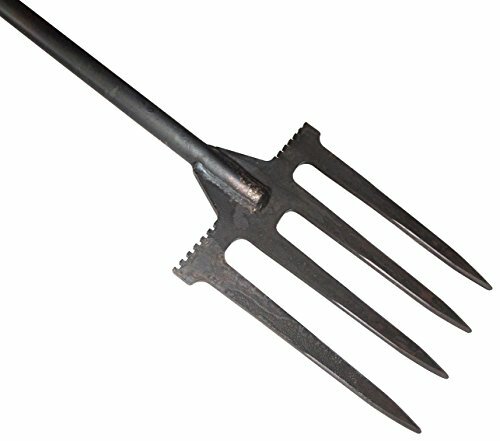 The DeWit Farmer's Boeren Digging Fork is practically indestructible! Handmade of hardened boron steel. Forged one-piece head and a tubular steel handle with oversized steel T-handle at the top with thick comfort rubber grips. Great tool for hard garden tilling to break up compacted soil. This tool is guaranteed a lifetime! On April 1, 1898, Willem DeWit started his blacksmith company in a small village in northern Holland. Today, the 4th generation of the forging family is running the company. Old-fashioned quality combined with innovative designs make DeWit the ultimate gardener's choice. Using the latest equipment and techniques combined with historical craftsmanship make DeWit one of the most respected garden tool manufacturers in the world. DeWit tools are made from high quality Swedish Boron Steel. European Ash hardwood handle is strong but lightweight, and also has elasticity so the tool can bend without breaking. The Ash hardwood comes from FSC (Forest Stewardship Council) certified forests. Tierra Garden is proud to offer these superior tools in the United States!